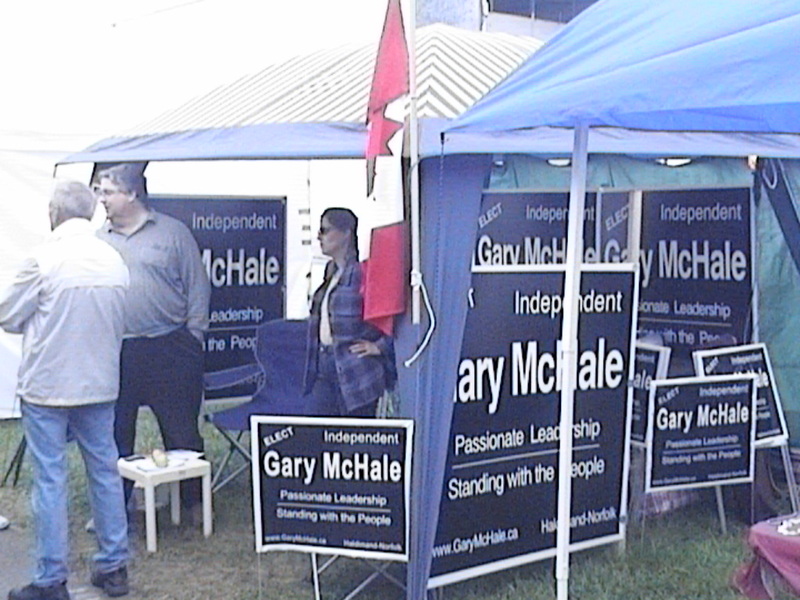 Gary started off Saturday, Sept 27th at the Farmer’s market in Dunnville and met many people who were upset by the continuous party politics put forth by both the PC and Liberals. People want someone to truly represent them in Ottawa and not a person who will forget about them after being elected. On Saturday, September 20th Gary and wife Christine participated in the Delhi Harvestfest parade. Afterwards, a number of people stopped to talk and ask for signs, including one resident who requested a 4’x4′ version for his property on the main road through town. One of those who spent some time with Gary was Richard Robillard from Generation Zel! Radio. He then posted an endorsement for the McHale campaign and declared that, for the first time in his life, he was not going to vote Conservative. Issues – Dare to Believe! With Conservative incumbent Diane Finley apparently chickening out, the stage was set for star Liberal candidate Eric Hoskins to shine. But the well-spoken Rhodes Scholar and war zone humanitarian was upstaged by Gary McHale, the well-known Caledonia activist (or, if you prefer, rabble rouser) who is running as an Independent. "Despite the OPP's and the McGuinty government's attempts to cast McHale as a troublemaker, Haldimand Mayor Marie Trainer thinks his candidacy is positive. With McHale in the race, Trainer says Haldimand's quest for peace, law and order, stability and justice will feature prominently in the coming campaign. She says McHale will force the other candidates to state their position on the issue of two-tiered justice. ""I definitely think he'll get some votes," Trainer said. "No doubt in my mind. We'll have to wait and see what happens on election night. People will change their minds right up to when they step in the polling booth. He will keep the land claims issue in the forefront."" "Residents of Haldimand -- a bastion of conservatism -- who are angry about ongoing native land claims in that county will have a place on the ballot where they can register their displeasure. McHale will siphon votes from all candidates, but Finley in particular. Our cabinet minister is in for a rude surprise if she tries taking Haldimand-Norfolk for granted." "But if the Liberals are to defeat Diane Finley, the country's minister for citizenship and immigration, they will have to meet her head-on with the two big local issues in Haldimand-Norfolk: a buyout for tobacco farmers and a resolution to the native land claims disputes in Caledonia." 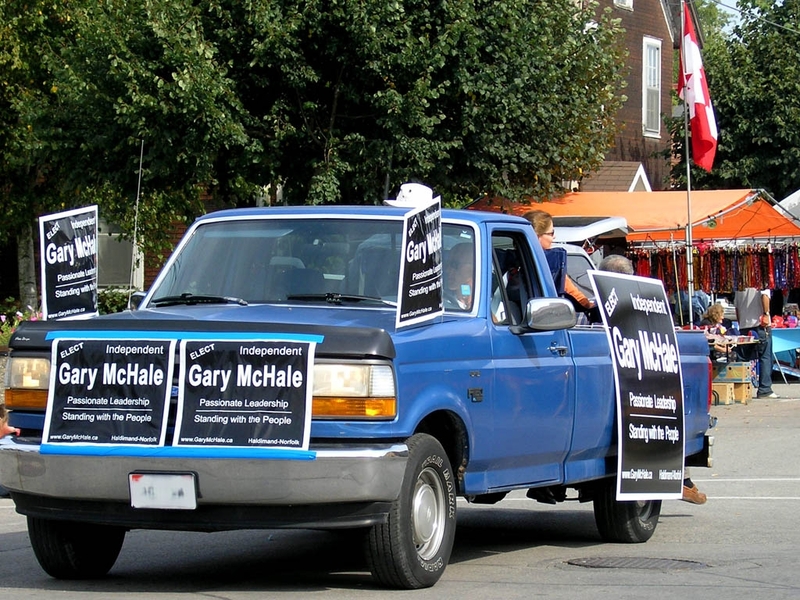 "Independent candidate Gary McHale, of Binbrook, has been an outspoken critic of law enforcement in Caledonia since the native standoff began in 2006. He says it is "outrageous" that Harper hasn't visited the beleaguered community since coming to power two years ago. "This would be treated as an outrage in the United States if the president behaved the same way," McHale said yesterday. "But we have such low expectations of our politicians that we accept it." Now that the campaign is underway, McHale said it would be "inappropriate" for Harper to make amends because that would be seen as a crass grab for votes in the midst of a communal tragedy." Simcoe Reformer, Sept 19/08: PM to avoid Caledonia? "...one could also make the argument (and many people do) that no one has taken the concerns of Haldimand to heart more than Gary McHale. Although people have questioned his actions at times, most would admit that his reasoning is predominantly justified. Many people would also say that he's done more for Haldimand than any other politician, simply by putting local issues on a bigger map." The Regional News, Comment by Bill Jackson, Sept 24/08: Does it matter where a candidate lives?</p?